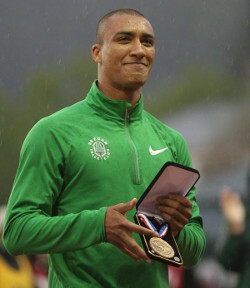 Ashton Eaton accepted the 2010 Jim Thorpe All-Around Award from the United States Sports Academy for his accomplishments in the heptathlon and the decathlon. Eaton received the award Friday, May 6, 2011 from Harry Marra, University of Oregon assistant track and field coach, in front of 6,251 fans at Hayward Field for the University of Oregon Twilight meet. Eaton now competes for the Oregon Track Club Elite. The Academy’s Jim Thorpe All-Around Award is presented to an individual who has demonstrated outstanding achievement in multiple sports and/or multiple events of the same sport. This individual should exhibit the qualities of versatility, strength, speed, flexibility, conditioning and training that exemplify superior athletic prowess. The University of Oregon student-athlete eclipsed one of track and field’s longest-standing records. Eaton broke 1996 Olympic gold medalist Dan O’Brien’s NCAA Division I indoor track and field record in the heptathlon – a mark which stood for 17 years. Eaton finished the seven-sport heptathlon event with 6,499 points, surpassing O’Brien’s record of 6,476, while he was at the University of Idaho. Eaton ran a personal-best time of 2 minutes, 32.67 seconds in the 1,000 meters to establish the new record. Eaton capped his illustrious career at Oregon in June 2010 by becoming the first athlete to win three consecutive NCAA championships in the decathlon. While the heptathlon is a combination of seven events, the decathlon is the track and field competition that totals 10 events. Past winners of the Academy’s Thorpe All-Around Award include Deion Sanders, Herschel Walker, Willie Gault, Danny Ainge, Julius Peppers and Brian Clay.